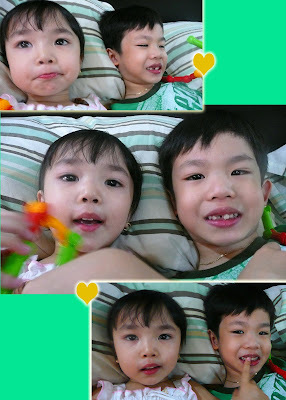 It is not unusual for me to see my boy and my girl, with a 3-year age gap, play together and chatter away as they let their imaginations run wild with their high-action stories and anecdotes from a TV show or make-believe adventures with their new toys. This can go on until they bore themselves and end up asking, "is it snack time already?" Today was no different except that it lasted for almost a full hour of non-stop banter and ramblings about their fictional Transformer world with their stick-figure-like robots made with colorful Zoob building pieces. I was supposed to be doing some long-overdue home bookkeeping for the rest of the day (receipts and bills have already piled up and needed to be cleared off my desk and dresser -- the same cluttered desk I wrote about before) but instead, indulged in their dramatics and be a willing audience. Since my boy will be back to school tomorrow, the Quicken can wait 'til then...I wouldn't want to miss this playtime! The Zoob is one toy I bought that was really worth the money. I think it was almost three years ago that i got this travel pack for my son, and now, my daugter gets to enjoy these as well as they create their own characters and imaginary figures with these DNA-looking pegs. With just five different pieces, you can build up to 20 combinations that let your child explore and be creative, aside from improving their dexterity and fine motor skills. Made by Infinitoy, you can learn more about Zoob products here. Soft Foam Play Pad is Great for Building on the Go! They always like to get comfy on our king-sized bed, and for the afternoon, my girl and her "Prowl" is battling the "evil forces" with "Ultra", my boy's fighter robot. As they engage with their imaginary aliens, sliding up and the down the terrain, a.k.a. dad's pillow, hiding in the cave (under the comforter) and finally, giving their warriors some rest while singing classical music from Little Einstein! I got confused there for a moment. I very much wanted to show you a short live action sequence as I took several video clips of their adventure in robot-land, but I still haven't figured out how to upload a video in this blog. The photo above is just a still shot of one of the video clips. Any quick tutorials out there? After almost an hour in their fantasy world, not without the usual kicking, shoving, biting, pinching, and crying in between, they finally tire themselves out and took a break. They spent a few minutes just lazing in bed then jumped off and excitedly went down to the kitchen with me as I invited them to help me prepare merienda (snack). The boy and the girl went back to get their "warriors" after dinner, and once daddy came to play, they left me with this...maybe a flower pot of sorts? * Listed price as of date posted. Click on link for current pricing from Amazon.com. Oh, I want to get the Zoob now! Thanks for showing me this toy! Beautiful kids! I haven't heard about Zoob sis. we also love zoob! :) my kids get so creative playing with them! Anne & Chris - we all love Zoob! :) great toy! Mel - They sell in local toy stores and online, I'm sure you'll like it too! wow this is a great toy! im sure my kids will go crazy these as they fave the building blocks toys. i've tried ordering items from amazon before but they don't deliver here. did you order from amazon? how did you get the items?